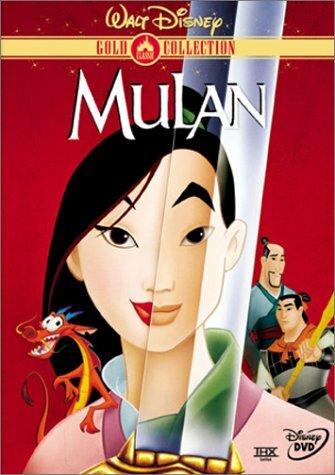 MOVIE REVIEWS: Mulan (Tony Bancroft and Barry Cook, 1998) | Bro. B.I.B. This is a movie that a lot of people seem to enjoy for one reason or another. To be honest, I really enjoy this movie, too. I like it a lot. My trouble, however, is I can’t seem to pinpoint why I like this movie exactly. What is it about this movie that I enjoy so much? Before I sat down to write this review, I tried asking myself, “Why do I like this movie as much as I do?” Granted, I don’t think it’s one of Disney’s best movies – it’s not within the top 10 or anything. However, I still like it a lot. I think it’s a good movie. But, again, why do I like it so much? Well, maybe this review can answer that question for me. ANIMATION: The animation in this movie is nice. It’s not the most impressive animation you’ll see in any Disney movie. I don’t know I think of past Disney films and how they were so great in showing off the location the films were set in. Remember how grand France looked in The Hunchback of Notre Dame? Remember how breath-taking and epic Africa looked in The Lion King…even if we don’t know what country it takes place in? With the exception of some of the backgrounds and designs in one or two of the songs, China isn’t particularly interesting to look at in this film. But that doesn’t mean this animation is bad by any means. I do like the colors in this movie. Anytime red shows up on the screen, especially in the background, it looks really impressive! You might be hard pressed to find a better red in any other film…Yes, that’s a great exaggeration, but you get the point. It looks good. The characters looks good. Everything flows together. Nothing looks odd or awkward or out of place like Tarzan. The animation isn’t the best, but it’s decent. SONGS/MUSIC: Once again, we have lyricist David Zippel joining us. Zippel, if you remember, contributed the lyrics for the songs in Hercules…(Sigh) Yay…Actually, these songs are much better! But instead of Alan Menken returning, we have song composer Matthew Wilder and score composer Jerry Goldsmith. The music as a whole does sound nice. If the animation doesn’t take us to China, the music will. Let’s go through these songs. 1) Honor to Us All: Is this song racist?…Or culturally insensitive? This song does not rub me the right way. We see Mulan and other young women getting dressed up to present themselves to a matchmaker and be deemed as a worthy bride. But in the song, we keep hearing them all say they want to bring honor upon their family…I don’t know anything about Chinese heritage and culture, I have to admit. This is why I ask, that’s not insulting, is it? Is it a stereotype of Chinese people or the Chinese culture? I don’t know…Well, at least the tune is catchy. The music is enjoyable, and it’ll leave you humming. If this number isn’t racist, offensive, or stereotypical, then that’s a good thing. I guess I’m on the fence about it. Yeah, I know everybody wants that sense of self-pride for themselves and their families, but do you hear Americans in American films walking around saying, “I will bring my family honor?” No. You don’t. If it’s not racist, the song is good. If it is racist, then it’s bad. End. 2) Reflections: This is a very nice song, and I don’t mean that simply for the enjoyable melody. I like what this song tells us about Mulan. She’s not just singing about wanting to express her true self or showing herself off to the world. She also wants to see the worth in herself. Think about it, the song is called “Reflections.” When you stand in front of a mirror, who’s reflection do you see? Yours. She wants to see herself. She wants to see somebody great. It’s not a matter of proving to other people who she is; it’s a matter of proving to herself that she is a great person. I think it’s a very nice song, and it fits her character and the theme of the film nicely. 3) I’ll Make a Man Out of You: And now we’ve come to it, the movie’s Number One song! I know they’re out there, but I have yet to meet the people who have seen this movie and don’t like this song. We all go nuts over it! We all look forward to this particular music number in the film!…Actually, I find that kind of interesting. I’m used to hearing and singing this song even when I’m not watching the movie, when I need to get energized for something. That’s what type of song it is – both the lyrics (mainly the vamp and the chorus) and the music get you hype and ready to face something dead on…But this song doesn’t really get me excited for the rest of the movie. I’m excited in the moment, but as soon as it ends I die out of that energetic mood. Also, pay attention to what Li Shang sings in this song. 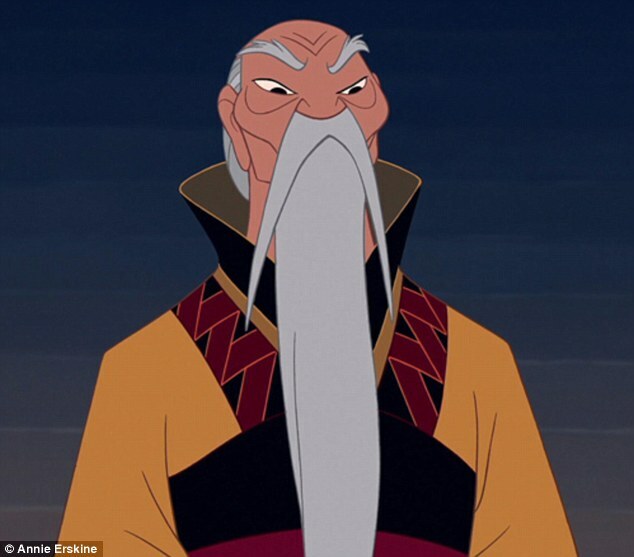 He goes from promising Mulan he’ll make a man out of her to sending her home and asking how can he possibly make a man out of her. For an army man, he’s not that strong. But I digress. I can’t hate this song. I love it just as much as the next guy. I might listen to this song at the gym…whenever I go. 4) A Girl Worth Fighting For: This song is…OK. It’s OK. I like it, but it doesn’t really have to do much with anything. Aside from designs and artwork that actually do look like China, this scene doesn’t really offer much. True, we also see Mulan saying women have brains and thoughts too, but we already know that. We see her fitting in with the other guys in the army, but, again, we saw that already. Why are they singing about this anyway? Couldn’t we have gotten an “I’ll Make a Man Out of You” reprise here instead? They’re finally going to fight – I think an intense and hype song number would have been much more fitting for this moment instead of slow male bonding. Again, though, I do like it. I like looking at it, I like the music, the words are fun…Although, who agreed on letting Yao sing? He sounds like he needs a lotion smoothie! 5) True to Your Heart: I frickin’ love this song! This number is fantastic! It sums up the message of the movie wonderfully. The music is great, mixing contemporary pop with funk! The words are good, and the vocalists are good as well. Actually, let me change that. The group 98 Degrees is good, but this number features STEVIE WONDER!!!!!!! YES! THANK YOU, JESUS! I am a HUGE Stevie Wonder fan! He does not disappoint here! I love the passion he puts into his performance! Him being here makes me love this song 1,000 times more! But the other elements I named earlier make me love this song even if Stevie weren’t singing this piece. I know some people can dismiss this song since it was written for the movie, yet it’s not performed in the same style or culture as the other songs. I understand that, and I’m not going to argue it. However, I still enjoy this song a lot. I think it’s great! CHARACTERS: The characters in this film, for the most part, are pretty good and decent. I don’t really dislike any of them or find them annoying…except for Cri-Kee. If he’s aware of everything of everything going on, why was he jumping around and nesting in the tea cup during Mulan’s meeting with the match maker? Didn’t he know what kind of trouble he would cause?…But I digress. Let’s talk about some of these characters. 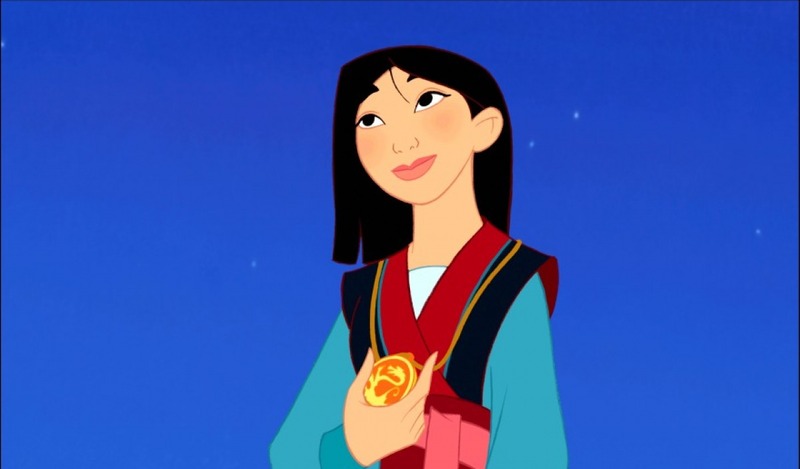 1) Mulan – I like her. I don’t think she’s the most interesting character, but there are some interesting things about her. I like watching her trying to compete with the men in the army. I like watching her fighting during battle. I like how smart she is. However, she does have some vulnerability to her. She realizes she doesn’t fit in with the other women or the ideas of her culture. Because of that, she wants to prove herself great. Unlike Hercules, however, her motivation isn’t so selfish. She doesn’t want to prove herself to people so that they can applaud and praise her; she doesn’t want to become a goddess. Rather, she wants to prove something to herself. That’s very relatable, and it gives her some depth. I like that. Go Mulan! 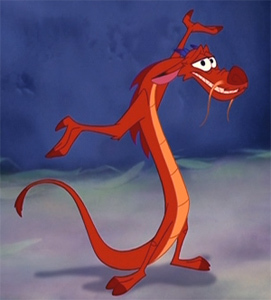 2) Mushu – To be honest, I shouldn’t like Mushu. 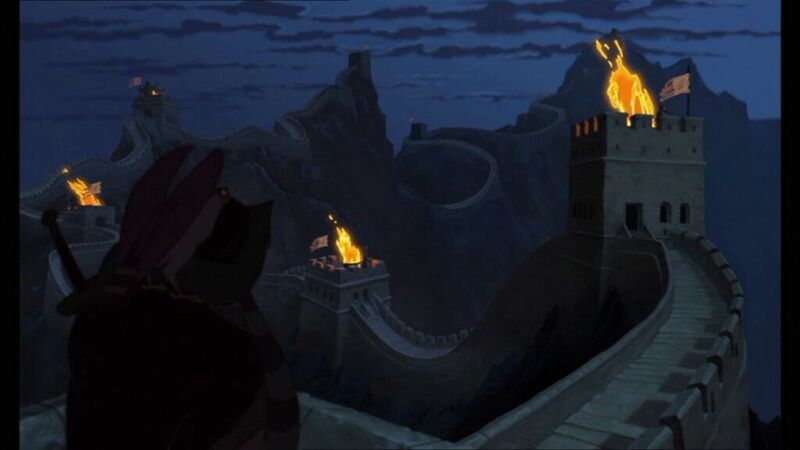 I know I go on about selfish characters and ambitions, and Mushu certainly tops the cake. He’s willing to put someone else’s life on the line so that he can be allowed back into the temple as a guardian over the Fa family again. Yeah. What a douche. He doesn’t really protects her as much as he pushes her into trouble. So why do I like him anyway? Well, he’s not all bad. He does, at least, try to help her. He supports her during the climax, and he has some pretty funny lines in this film. And, of course, he’s voiced by Eddie Murphy. I’m sorry, but that is cool! I like Eddie Murphy in this role! Of course there are characters he played that I didn’t like, but I do like him a lot, and he does a good job in this role! Go Murphy! 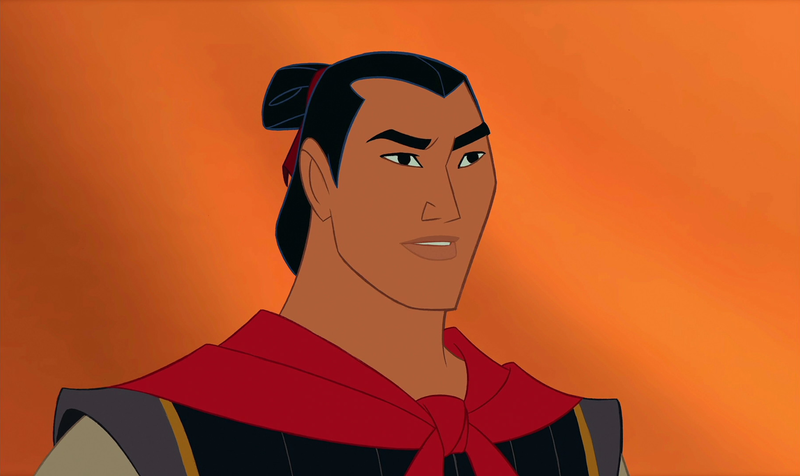 3) Li Shang – Um…he’s OK. He’s strong, he’s courageous, and he’s a good captain. But, again, he’s kind of bland. If you take away his position of captain, what kind of character do we have here? Do we know anything about him? Do we know what he likes or who he really is? He’s not as dull or boring as Kocoum from Pocahontas, but I do find him as bland as Eric from The Little Mermaid. However, he does get points for having his singing voice performed by Donny Osmond! Go Donny! 5) The Emperor of China: I know I should have talked about Yao or Ling or Chien Po, Chi-Fu, or one of the bigger characters in this film, but there’s no way I’m leaving this guy out! Why? Because he’s AWESOME AS CRUD!! !I know he doesn’t do much in this film. I know he doesn’t say much in this film. I know on a grand scale, he’s not that memorable. But you watch him whenever he’s on screen, and tell me he isn’t the coolest thing animated in this film! His dialogue is amazing! Listen to the wise words he says in every scene he’s in. “No matter how hard the wind howls, the mountain will not bow to it.” “The flower that blooms in adversity is the most rare and beautiful of all…You don’t meet a girl like that every dynasty!” All this guy needs is a mic drop! Give him a microphone, and he will own this entire movie! Plus, he was voiced by frickin’ Pat Morita! Rest In Peace, Mr. Morita. STORY AND THEMES & MESSAGES: The story is good. 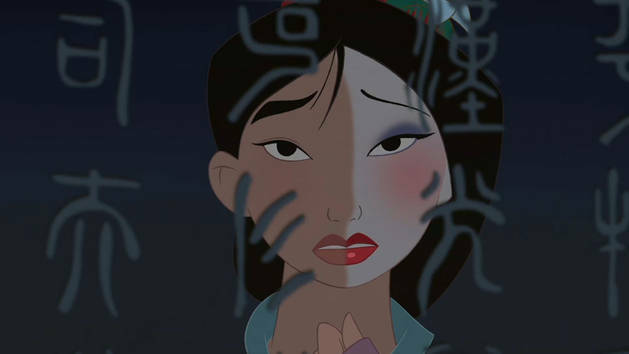 Everything from Mulan’s focus is pretty clear and straight forward. It’s been done quite a number of times before – in fact, it actually reminds me of Pocahontas – but the sequence of events are entertaining and good enough to make this movie stand out. If you look at the story from another character’s focus, however, it may not hold up very well. I’m thinking primarily of Shan Yu, and this may be why the character himself does not work. What is his plan? Why is he doing all of this? In fact, what is he even doing? A character is supposed to execute a number of actions (what are they doing) that lead to their objectives (what do they want); and a character’s objectives leads them to their super objective (what do they want most of all). Mulan, for example, takes her father’s armor and horse (that’s what she does) in order to protect her father (that’s what she wants). She tries to succeed in the army and win a battle (that’s what she wants) in order to prove to gain self-pride (what she really wants). One thing leads to the other, and we see what she’s doing and what she wants. I have know idea what Shan Yu wants. He ultimately wants the Emperor to bow to him, but why? What is that going to do? He later strikes Li Shang and accuses him of taking away his victory. What victory? How was getting the Emperor to bow to him going to bring him glory? What was he doing? I don’t understand it. Maybe I missed something, but I don’t understand what Shan Yu’s objectives were or how his actions led to his super objective. I know a lot of people like the “Girl Power” aspect of the film. 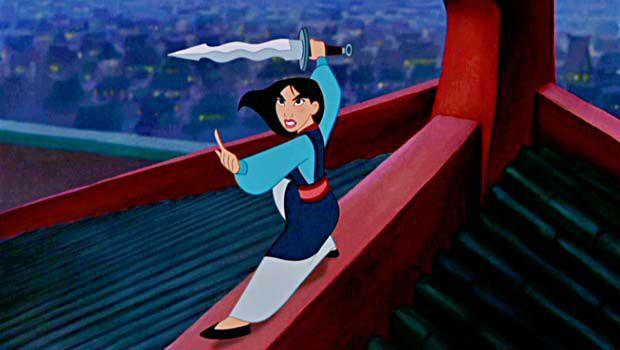 Seeing Mulan fight in battle and hold a sword was awesome for a lot of people. To be honest, it wasn’t that exciting to me. That’s not to say that it’s not done well in this movie, or that I’m against women doing things that are often looked at as “men’s work.” (Even though there are things men can do that women can’t and vise virsa due to our biological structures.) But I didn’t really think there was anything wrong with fighting. Even as a kid, I don’t know if I ever thought of fighting as a man’s job and baking as a woman’s job. Maybe I did when I was a little kid, but as I got older I realized that there’s no difference between what men can do and what women can do (aside from those biological structures). But, then again, there will always be people out there who have sexist opinions and thoughts, and often times those opinions and thoughts are passed down to children. So, maybe it’s good to have that message in this film. With that being said though, is this film saying China is or was a sexist country? People in this movie constantly say that a woman’s place is in the house, tending to her work, speaking only when spoken to. While, of course, Mulan does something conventional and proves how insane that idea is, China is still presented as being incredibly sexist. I’m sure it wasn’t intentional, but it still comes off that way. This is the reason I get nervous when Disney tries to represent other cultures: they’ve been known to do it so poorly. It’s not done poorly here, but there are still problems. Whether every other character uses the word “honor,” an entire country and nation is displayed as sexist, or only some of the voice performers are Chinese while the rest are Japanese and Korean, Disney doesn’t always represent other ethnicities with the most dignity or sensitivity. Now, of course, there will always be someone to say, “Hey! That’s racist!” I’m totally aware of that. And, in all honesty, Disney didn’t represent Chinese people that bad in this movie. I always say that so long as they focus on the humanity of a character and culture and not the stereotypes or differences, that’s what count. In the past, Disney projected racist images of Asian-Americans, like the Siamese cats in Lady and the Tramp, or the obviously racist Asian cat in The Aristocats. Here, they focus on the story and the characters, and making them relatable to everyone. I love that. CONCLUSION: As I said before, I really like this movie. As of now, it’s one of my favorite Disney movies. I think I like this movie so much because of the heart of it. 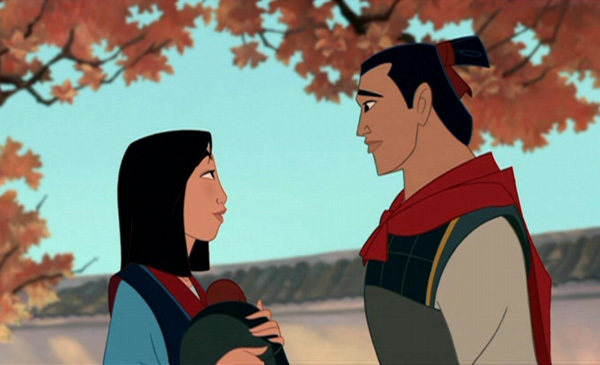 There’s a lot of heart in the message, in the story, and in Mulan herself. I also like the comedy in the movie. I like how entertaining it is. I think this film is kind of like Aladdin, only this film is not as entertaining as that film, and the bright, popping colors have been replaced with some red and some white backgrounds. (Actually, if you think about it, there are a lot of similarities between Mulan and Aladdin.) I like it, I enjoy it, and I look forward to watching it again!